Cultural and Creative Industry is mushrooming in Taiwan, and there is a name in Chinese that well describes those immersed in this industry. 文青which literally means young culture and literature enthusiast. However, Gibson can’t find any English noun that accurately define 文青，some suggests “hipster” but it may sounds too negative, so Gibson decided to describe the term as “culturer”, so let’s be a “culturer” and start our culture’s journey in Tainan. If you like to hunt for food instead, here is the list that you should look. Shennong Street is an old street in the old city, a bit like our George Town, but they are more organize and well-planned, which they remain the nostalgic feel of heritage in the day, but transform into energetic social cluster at night with F&B and entertainment. We are here to be the “culturer”, so we only visited the place during the day. To come here is rather easy in the city, just hop on the Taiwan Tourist Shuttle No.88 Route, then hop off at Shennong Street station. Taiwanese often come here for 2 objectives, which are for the deity and the wood. Both are related though. This is due to the sacred palanquin shop here that is one of the important element in the development of the temple in the region. With the characters 永川大轎 on the old building, the moment you get to Shennong Street, you will immediate see the shop with those characters, which is the old address of the shop that had moved further down the road to a bigger space. Tainan is well-known with its mushrooming number of temples, so it is not a surprise that you will bump into a temple parade celebration. Gibson was lucky enough to witness one. Besides the interesting palanquin legend, there is another wood you need to look for. Dove Tail wood workshop is not just a workshop but also a café that provides several services such as Handmade Woodcraft & Furniture / Creative Carpentry Classroom / Architectural Design / Coffee & Tea / Yogi Cuisine. Business Hours: weekday 11am – 4pm, weekend 11am – 6pm, closed on Tuesdays and Wednesdays. If Zhengxing Street is considered as the cultural and creative street of Tainan, then Jia Jia West Market Hotel serves well as an iconic building of the street. They describe themselves as a hotel with life and still growing every single day, they are here to tell the stories of old Tainan in a modern way. The hotel themes well with cultural and creative elements, and the façade itself already portrays well of their artistic identity. Their room rate is started from NT $2560. Right outside the hotel, you will find many stalls that are set up next to the street like flea market. There are numerous cultural and creative products and souvenirs to buy. After finishing touring the old street and cultural & creative street, it is time to visit the cultural & creative cluster in the region at Blueprint Cultural & Creative Park. The newly opened park is the successfully transformed from an old government quarters into a tourist spot. 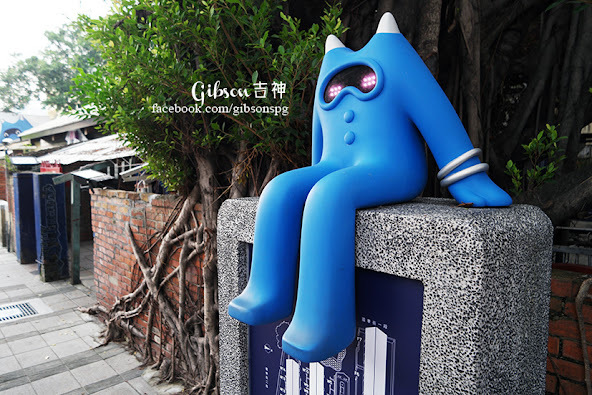 The mascot of the park—BLUES is the creation of the well-known artist AKIBO. As you can find a few murals in the park, this one was done by Creepy Mouse. Gibson likes the concept of the park, where the one who creates not only set up their workshop here, but also showcase their ideas and concepts, while being a platform for their merchandise. IMIN Tainan is one of the workshop that Gibson recommends, where they can custom made almost anything with their advance printing gadget, and most of the product can be done within a day as long you can produce the photo. There is a public art exhibition on the roof top, where the artist Jen Ta-Hsien uses lines to creatively produce art pieces. Business Hours: 1pm – 9pm, closed on Tuesdays.